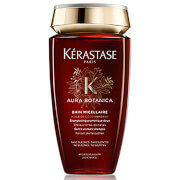 Treat your locks to the Luxury Hair to Go Aura Botanica Gift Set from Kérastase. Presented in a branded box, the unique, advanced formulas work in tandem to cleanse, condition and delicately scent hair from root to tip. Utilising 96% natural origin ingredients, including responsibly sourced Samoan Coconut Oil and Moroccan Argan Oils, the nourishing shampoo gentle yet effectively cleanses away dirt and impurities; it transforms into an airy lather and harnesses natural micelles to lift away dirt for shinier, revitalised locks. Hair is protected against frizz for 72 hours and looks nourished, three times shinier and re-energised. A lightweight yet deeply moisturising conditioner from the brand's natural haircare collection. Delivering intense nutrition and frizz-fighting benefits, the deep conditioner melts effortlessly into the hair fibre, imparting a cocktail of natural oils (Coconut, Argan and Sweet Orange) to expertly nourish, moisturise and detangle. The revitalising conditioner will re-energise lifeless hair and delicately perfume locks with its Sweet Orange Essential Oil fragrance. A lightweight, bi-phase formula that combines four nutritious oils (Jojoba, Avocado, Coconut and Argan) with an aqueous solution of organic Damask Rose Water; the two layers work in synergy to infuse hair with nutrition, moisture and frizz-fighting benefits. The leave-in treatment can be used as a hair primer before blow-drying, or for misting over dry hair to enhance softness and radiance. 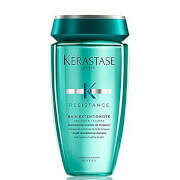 Shampoo: Apply to wet hair, massage well to release its rich, airy lather and aromatic fragrance. Rinse well. Conditioner: Apply to wet hair after shampoo. Leave up to 5 minutes for maximum benefit and rinse off. 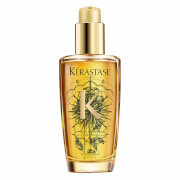 Oil: Apply 1-2 pumps on dry or wet hair as a leave-in treatment. Use as a finishing product to touch up throughout the day.